While making a pie or tart from scratch using your own home made pastry is great sometimes it’s just a lot easier and quicker to use bought pastry. This plum tart recipe uses sheets of puff pastry which are blind baked before the filling is added. Blind baking isn’t particularly hard to do, but some people find it a bit daunting. Although Mum must have blind baked quite a lot of pies in her day I like that she took the trouble with this recipe to still set out the steps needed. 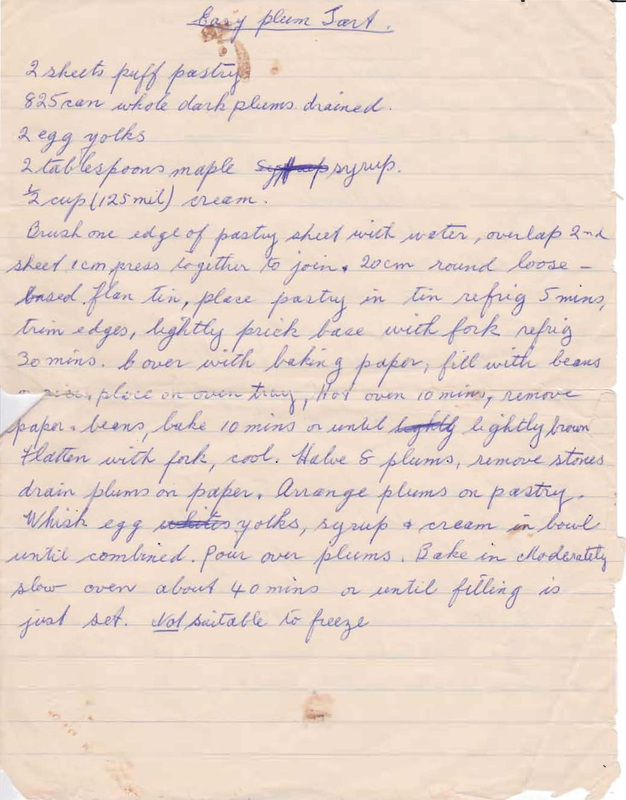 This entry was posted in All Recipes, Desserts and tagged 1970s, blind baking, cream, easy plum tart, maple syrup, plums, puff pastry by bebsrecipes. Bookmark the permalink.